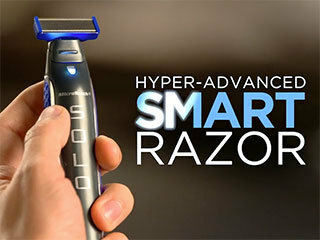 Shave, Trim and Edge with MicroTouch Solo, the precision-engineered all-in-one razor with a replaceable dual-sided German Stainless Steel Blade and built-in LED light. Convenient and easy to travel with - does not require water or shaving cream, so there's no mess. The built-in lithium-ion battery lasts 45 minutes and conveniently recharges with an included USB cable. MicroTouch Solo all-in-one razor cuts through the thickest beards and leaves no nicks, no bumps, no razor burn, no irritation and no in grown hairs.